In Parts I and II in this series on how individual anatomical differences can impact squat performance we covered the effects of various levels ankle mobility, hip mobility, and hip boney anatomy. 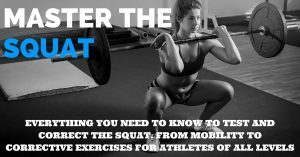 These two articles provide a significant amount of evidence for the need to individualize our squat technique prescription to every athlete that we work with. 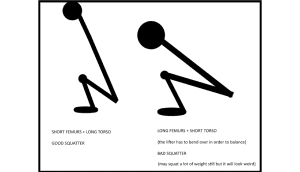 This week’s article will further investigate the effect of femur length (anthropometrics) on an individual’s squat. Let’s first begin by discussing bar position during the squat. In order to have the most efficient technique possible, the barbell should be over the middle of the foot. If the barbell (and thus the body’s center of gravity) falls behind an imaginary line drawn vertically from the midfoot, the lifter will fall backwards. If the barbell drifts in front of this imaginary line, the moment arm will be increased placing extra stress on the lower back and making the lift significantly more difficult. So as we discuss femur length’s effects on squat performance we will standardize the bar placement to be in line with this imaginary line rising vertically from the midfoot. Next, let’s go with the example of an athlete whose femur length is short relative to his or her torso. 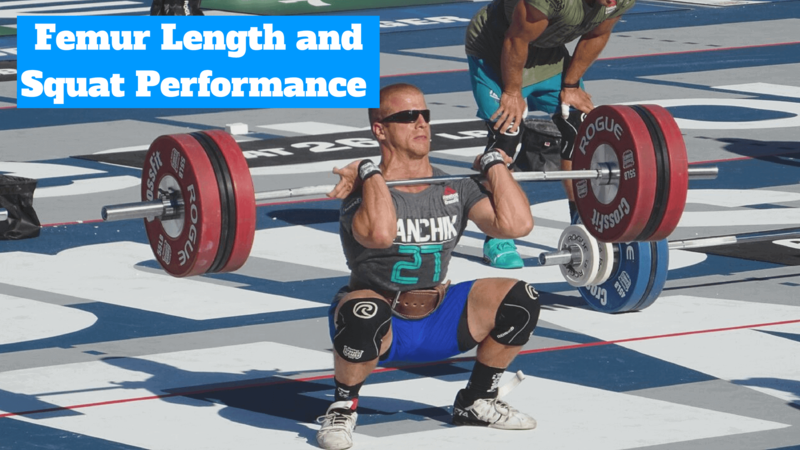 As the athlete is in the bottom position of a squat, his or her torso being relatively long will make it much easier for them to keep the barbell over the midfoot while maintaining a fairly vertical torso. On the opposite hand, a short torso relative to the femur means that the athlete must have a more forward torso angle to reach barbell over midfoot. Many will say that this back angle is wrong technique, but in the case of athletes with this anthropometric makeup, this technique is acceptable and what they MUST do to squat with the barbell staying in proper position. Here is where this second scenario (long femur) becomes tricky…. Now let’s say that this athlete’s hip boney anatomy makes it difficult for them to move through significant hip flexion range of motion. Now that combo of long femur (requiring a more forward leaned torso = hip flexion) plus limited mobility can become a larger problem. Externally rotate the legs. See the below picture with my legs pointed forward (left) and then rotated outward (right). As you can see the left femur is “longer” when viewed from the side than the right that “shortens” the femur. This functional change in leg lengths can be enough to fix the squat pattern. Increase the amount of dorsiflexion (or raise the heels) that will push the entire center of gravity of the body forward sometimes enough to get the athlete in better position.